October sweeps in on a wave of insanely glorious sunshine and a tsunami of bonkers pink ribbon promotions. If you were reading Chemo Chic this time last year, you will know that I am all in favour of raising money for breast cancer charities and being generally aware of the signs of BC to look out for. But some of the ways that companies latch onto this particular good cause to push their products is suspect, bordering on outright exploitative. First out of the traps is Hard Rock Hotel and Casino, Tampa, Florida. So if you fancy gorging on hamburgers whilst gambling away your lifesavings for the cause, grab a cab to Heathrow now!They are running a”limited availability Pink Sheets guest room promotion including complimentary commemorative Hard Rock pin”. 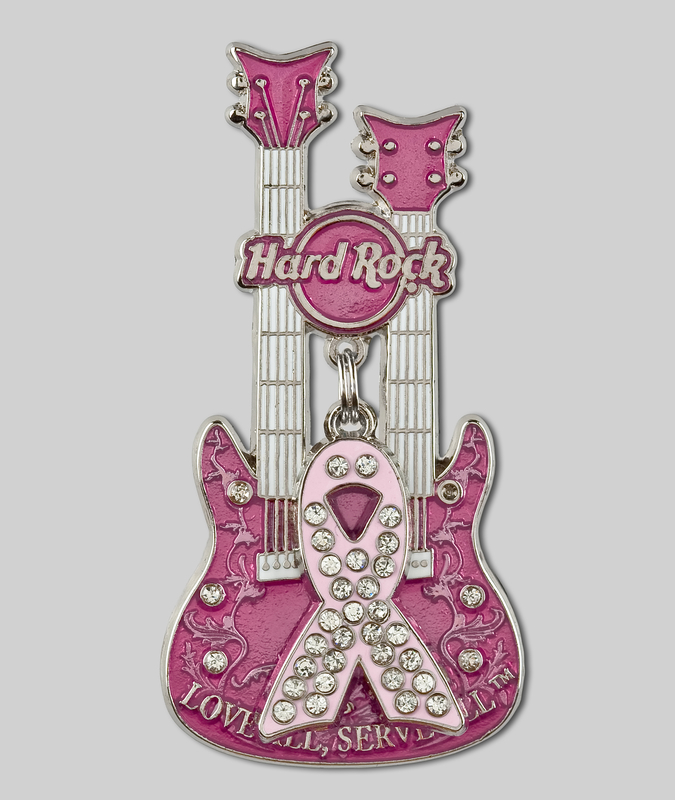 Should you not feel pinked out enough you may wish to pop down to the gift shop to pick up a few pink bath robes, ‘collectible’ Hard Rock Pinktober charm bracelets, t-shirts, leather vests, sleepwear, travel mugs, bandanas, and pink-hued guitar-embossed, bedding. Between 15% and 25% of your cash will be donated to breast cancer research, depending on what you buy. Alternatively you could stay sitting in front of your computer, take a few minutes toclick on a link, fill in your card details and donate directly to your favourite breast cancer charity – which will receive 100% of the money. Then snuggle up on the sofa with a pink cushion and a cup of green tea to watch Downton Abbey, as I will be doing. I am not here to judge you. If you want to support breast cancer charities by filling your home with cheap tat, please be my guest. There is no harm in it. But I draw the line when companies start pushing pink ribbon products that contain ingredients known or highly suspected to promote breast cancer. This year’s top contenders for the Pink Hypocrisy award include American breast cancer charity Susan G. Komen for the Cure for their fundraising perfume ‘Promise Me’. According to Breast Cancer Action’s ‘Think Before You Pink’ campaign the pink-ribboned scent contains: ‘Galaxolide – a synthetic musk that works as a hormone disruptor, and Toluene, a potent neurotoxicant.’ Honest injun! ‘Promise Me’ is joined by another of the usual suspects: Estée Lauder’s Elizabeth Hurley pink ribbon collection. I will eat one of those BHT, Octinoxate, Alumina and synthetic fragrance containing little pink sticks if anyone can tell me one constructive thing that our Liz has done to advance the cause of breast cancer prevention, other than show up at parties sponsored by Estée Lauder.